One set-up and now digital 4-Color Process. 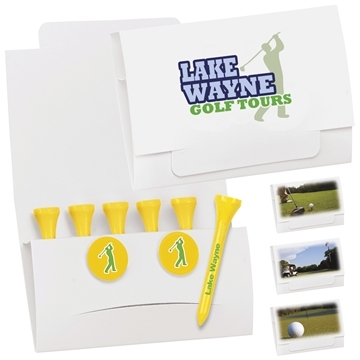 Materials: Packet: paper, Tees: wood, Ball marker: plastic. AnyPromo has always managed the right balance between price and fashion and usability- this is a prime example! Very pleased with the outcome of my order. I have been happy with how our logo looks on the many different products we have ordered from AnyPromo. the sample and the evenutal purchased product were the same. My boss was very impressed with the quality and also the timeliness of receiving the order in less than a week. the imprinted logo looked great! They're an excellent publicity giveaway!